Case Presentation: A previously healthy 77 year-old woman with a history of porcine mitral valve repair (MVR) presented with left knee pain. Three weeks prior to admission she experienced general malaise and intermittent chills. She then fell resulting in left knee pain and presented three days later due to inability to walk. On examination, she appeared ill with normal vital signs. She had an appreciable left knee effusion and pain with motion. Laboratory analysis revealed leukocytosis, lactate acidosis, elevated erythrocyte sedimentation rate and c-reactive protein. Left knee arthrocentesis revealed elevated white cells. Empiric antibiotics for septic knee were started, and her knee was irrigated and debrided. Blood, joint fluid and urine cultures grew E. coli. Despite repeat blood cultures being negative, she continued to have low grade fevers. Given history of MVR, an echocardiogram was performed, revealing a 0.4 x 0.7cm vegetation on the mitral valve (MV). Although she had no overt neurological deficits, a brain MRI was obtained revealing multiple infarcts presumably septic emboli. Due to surgical risks, she opted for conservative management. A few days later, antibiotics were broadened due to increasing leukocytosis and ESR. On day 12, she was noted to have aphasia. Brain MRI revealed new infarcts and a repeat echocardiogram revealed enlarged and mobile vegetation. Due to the risk of hemorrhagic conversion of CNS emboli surgery was delayed. 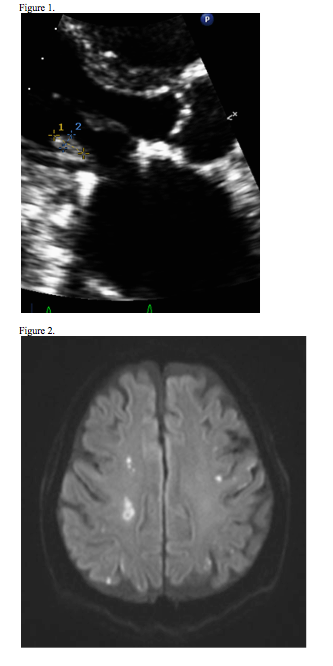 However, she soon developed diplopia and right numbness and MRI showed new acute infarcts. She was taken to surgery and found to have vegetation and abscess involving MV. A porcine valve was placed with reconstruction of the atrioventricular groove. She was eventually discharged to a rehabilitation center on antibiotics and anticoagulation. At discharge she was alert with no neurological deficits. 1. Murdoch, DR, et al. Archives of internal medicine 169.5 (2009): 463-473. 2. Morpeth, S, et al. Annals of internal medicine 147.12 (2007): 829-835. Churnet B, Warltier KM. A Case of E. Coli Endocarditis. Abstract published at Hospital Medicine 2016, March 6-9, San Diego, Calif. Abstract 471. Journal of Hospital Medicine. 2016; 11 (suppl 1). https://www.shmabstracts.com/abstract/a-case-of-e-coli-endocarditis/. Accessed April 26, 2019.